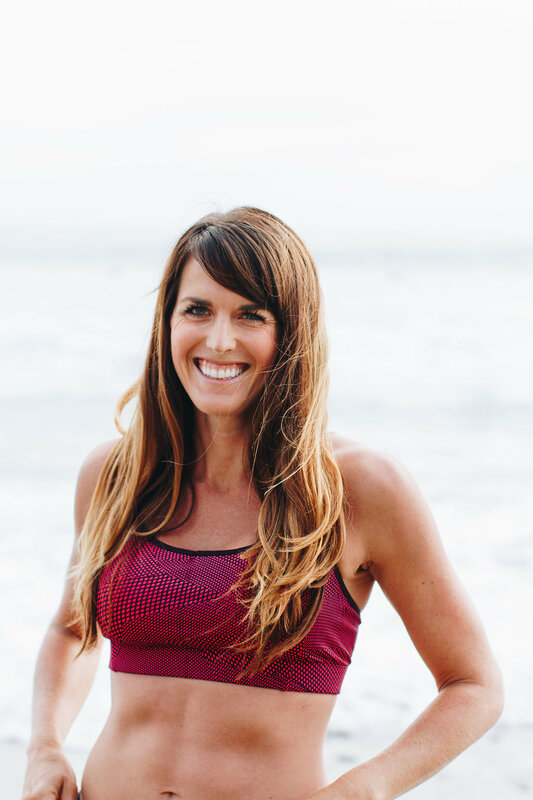 With the Solana Beach Sprint Triathlon only six weeks away, I’ve had to dive straight into training even though I’m only a week out from my first marathon. Luckily, I’ve got the run part of the triathlon covered with my marathon training and I was on the swim team in high school so I have a slight advantage there. The bike is the going to be the biggest adjustment for me. On Sunday I started my triathlon training officially with a spin class and my first swim in 10 years. I got to the gym early so that I could reserve a spot in the coveted 8:30 a.m. spin class and then went to the locker to room to change into my swim gear. After putting on a one piece bathing suit and swim cap for the first time in the last decade, I made my way to the pool and got in. It didn’t take long for me to warm up and get back into the familiar rhythm of freestyle stroke. I even was able to remember how to do a flip turn without getting water up my nose! I started out with a few easy laps. The pool was 25 meters long and at first I took breaks after each there and back. After a while I started going even longer, to 50 meters, and by the end, I completed a 200 meter swim without stopping, flip turns and all. I did a few laps of breast stroke as well (my main swim event in high school). I cooled down after about 35 minutes, for a total of a 40 minute swim. Not too bad for my first swim back! Overall, I was surprised by how winded I was by swimming laps. 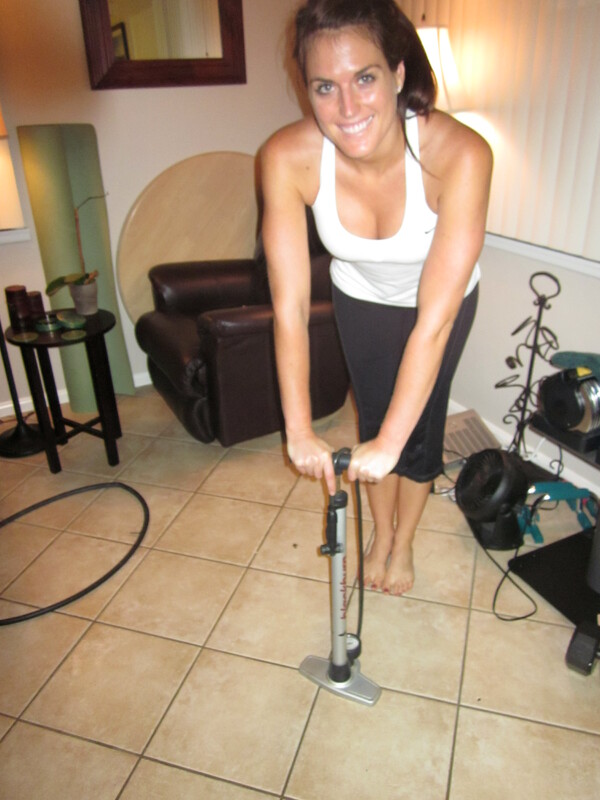 For some reason I don’t remember it being such a great cardiovascular workout. After changing back into my normal gym gear, I hopped on a stationary bike in the group fitness room and did a 60 minute spin class, complete with standing and sitting sprints and lots of very steep hills. It felt great to be back in class. For a while last year I was a regular at a 6 a.m. spin class at the gym near my old house, attending about two classes per week. However, since I moved away from that gym and really started training seriously for marathons (and started P90X), I haven’t been back. Luckily one of the things that I don’t have to buy for this triathlon is a bike. My dad is only slightly taller than me (bike frames are sized mostly based on your height), and he agreed to lend me his road bike. A month or so ago Mike and I went to the bike shop and purchased a helmet, shoes, and bike shorts for me. 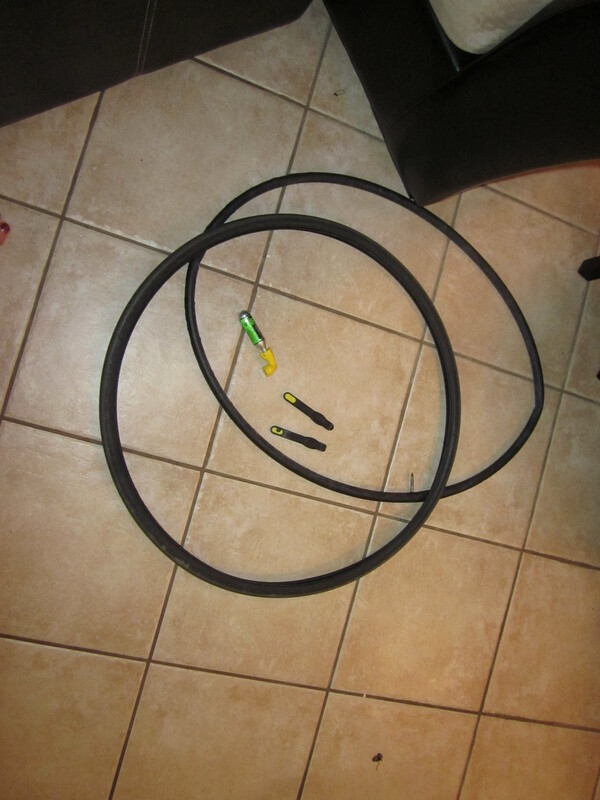 We also got two new tubes and tires, because both of the tires on my dad’s bike were flat. 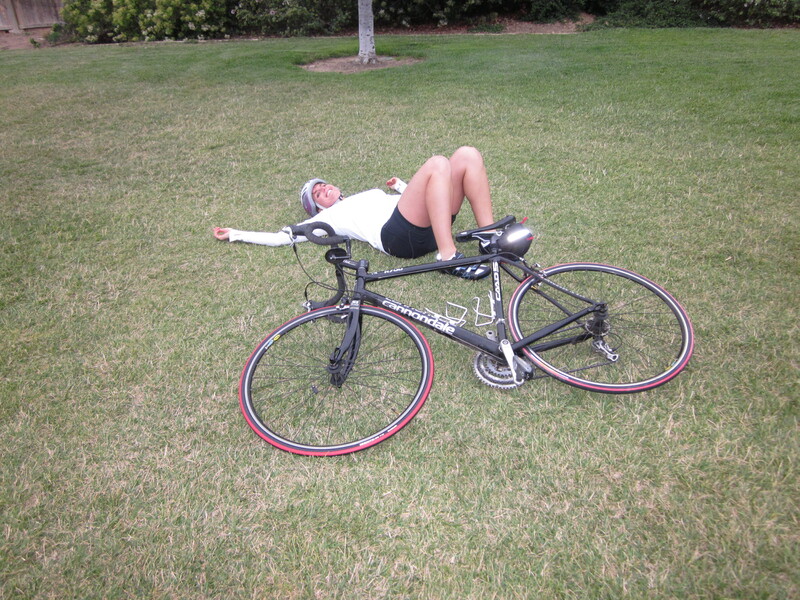 On Monday night, Mike gave me my first real lesson in triathlon training – how to change a tire. If you happen to get a flat tire during a race, you have three choices: 1) ride on the flat, 2) walk or run your bike, or 3) change the flat. On a short course like a sprint, I’d probably chose 1 or 2, but on a longer race like a 70.3 mile half Ironman, I’d have to change it myself. Not to mention if I ever start riding my bike to work, I’ll have to change a flat if I get one on the way. Unfortunately, flats are very common so I will definitely need this skill several times during my triathlon career. Changing the tire was much more difficult and time consuming than I anticipated. Luckily, most of the time you only have to change the tube that is inside the tire and it is easier to fix. Replacing both the tube and the tire like we did is more difficult. Although I think that I picked up most of what he taught me, I may need a refresher. I really hope that Mike is around for my next flat! 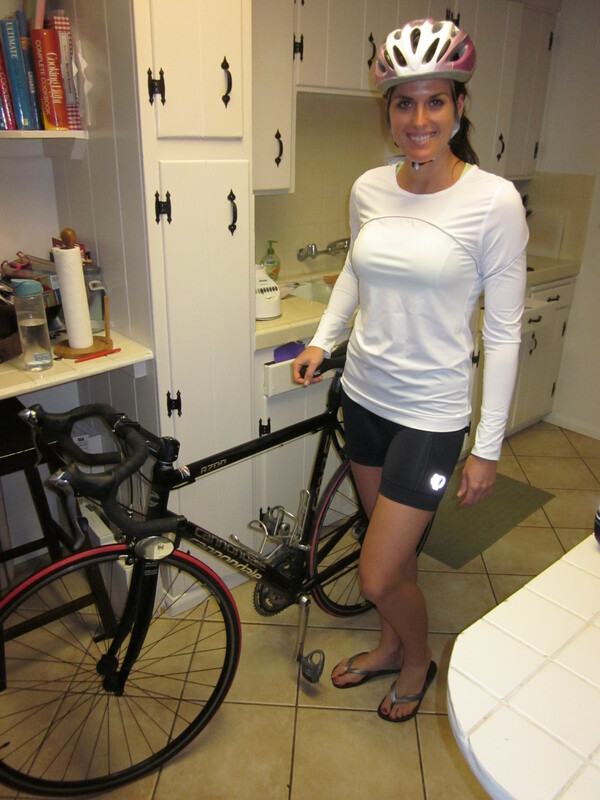 Triathlon training 101 continued on Tuesday night with my first ride on the bike. We didn’t schedule a serious ride, just a training session on how to clip in and out of the bike pedals and get it going. We went to a local park and got the bike on some hard grass. First Mike gave me a lesson on how to get my shoes in the clips. As soon as he started talking, a curious bum came over and stared at us for a while, standing a little too close for comfort. Eventually he started asking a ton of questions about what we were doing biking on the grass. He had no idea what clips were. He also asked us how much the bike cost, how many gears it had and how much it weighed. Once our new friend got distracted and left, we went on with the lesson. I was very nervous that I was going to immediately plop over, but with a lot of luck and some skill, I got my feet clipped in on the first try and was riding the bike across the grass! I even was able to slow down and clip out without falling. I practiced this maneuver over and over again, probably over ten times. Once I had a bit more confidence, I decided to try to brake harder to stop and when the bike stopped suddenly, I wasn’t able to get my feet out of the pedals quickly enough and I toppled over. It was exactly like everyone said it would be – I felt myself falling but there was literally no way to stop it. Just embrace the fall. Overall, I’m feeling both nervous and excited for the race. I’m glad that I have several weeks to practice but I’m not 100% confident that it will be enough time for me to get completely comfortable on the bike and swim portions. However, we (Asia, Jeremy, Mike and I) joined the local Triathlon Club and there are a ton of resources to help us get better (Mike has already done an Ironman so he doesn’t need the help but the rest of us are all newbies!). The first event we are attending is a group swim tomorrow night at a local community center. The second event will be a very informal practice triathlon for beginners this Saturday. The “race” will be very short and very informal. My main fear is that I will fall over while clipped in. Luckily the swim is in a bay so we won’t have to deal with the waves. As previously mentioned, Mike and I have also started our second round of P90X. We will be training for a triathlon and a half marathon (in August) while we do this round. We’ll be getting a minimum of one bike, one swim and one long run in per week on top of five of the six P90X workouts (no Kenpo). I hope that this schedule isn’t too difficult to maintain because I really don’t want to give up any of the workouts! I would have a hard time choosing which P90X workout to skip. Here we go! Swim – Bike – Run!!! !